I'm working on a story about this Tacoma MCM collector's carefully curated home. Stay tuned. This is my friend's Shawn's house. Repetition of color contributes to a cohesive look in this open-concept mid-century modern home. Posted on July 7, 2013 by Kathy McMahon and filed under Uncategorized. I just went to the George Nakashima exhibit today and really enjoyed it. It's small, which makes it easy to take it all in and appreciate each piece without being overwhelmed. Afterwards, my husband and I had a phenomenal lunch at Phnom Penh Noodle House just down the street. The exhibit only runs until the end of January so get there before it's gone!Wing Luke Museum of the Asian Pacific American Experience. Posted on January 17, 2013 by Kathy McMahon and filed under Uncategorized and tagged exhibits nakashima. Tacoma house I've always liked. 2132 N Orchard St, Tacoma, WA 98406 | MLS# 349698. Posted on May 24, 2012 by Kathy McMahon and filed under Uncategorized. A current Tacoma dweller former Tucson dweller (like me) shared this photo with me recently. 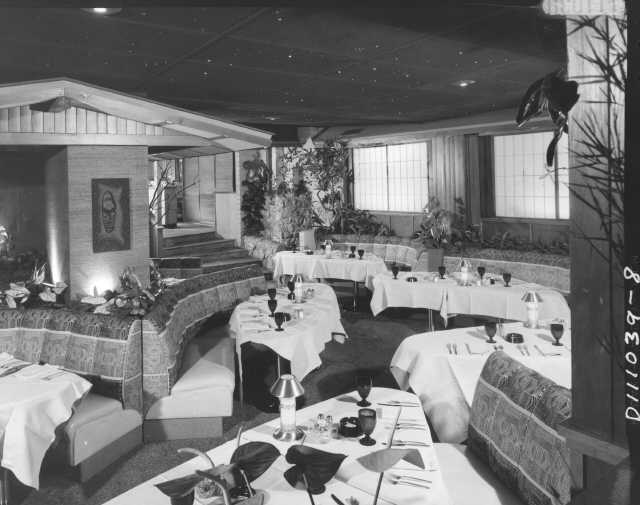 It shows what the Midcenturyville space was in 1957—a bar/restaurant called The Islander. Posted on May 17, 2012 by Kathy McMahon and filed under Uncategorized. The big book of California Design 1930–1965 « Felt & Wire. Posted on May 5, 2012 by Kathy McMahon and filed under books and tagged California design history. I thought it would be fun to kick off this blog with a few chair transformations. I. This pair of chairs had nice frames, which is why I bought them, but the fabric was a mottled pink paisley and they looked like someone had spilled bleach on them. The cushions unzipped so I dyed them red so the color would at least be uniform. It was an improvement, but they still needed help. I decided they were the perfect candidates for reupholstering with a nubby green vintage fabric I had purchased a few months back at an estate sale. Once I started ripping the fabric off, I could see that there was nice leather underneath but that all of the buttons were missing. I took the chair to locally owned Durobilt and they put some new buttons on for me. III. The last piece is a Milo Baughman (one of my favorite designers) swivel/tilt tub chair on a walnut base. When I bought it it was dirty, had a cigarette burn on the back, and the fabric was really dated looking. Again I used a vintage fabric I had been saving for the perfect project and had Durobilt work their magic. Posted on April 30, 2012 by Kathy McMahon and filed under Uncategorized and tagged mid century modern chairs upholstery.